The village of Tomintoul is charmingly situated in the foothills of the Cairngorm Mountains, within the National Park and a stones throw from the famous Glenlivet Estate and home of the Glenlivet distillery. 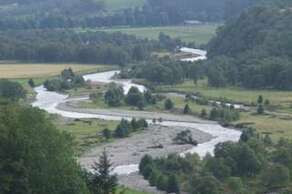 It lies on the main route between Deeside and Speyside near the Lecht Pass. Tomintoul was founded in the Eighteenth Century by the Duke of Gordon to provide homes and employment for the local people who were mostly weavers. Tomintoul is an ideal base to explore the regions wonderful countryside. Safe footpaths and cycle routes take you through breathtaking views of the River Avon and Conglass Water and the woodland and heather covered hills, with the Cairngorms as a backdrop. An amazing variety of wildlife can be encountered on even the gentlest stroll. Slightly further a field there are battlefields, ancient monuments, castles and picturesque towns and villages. Winter is spectacular with the Lecht Ski Centre on the pass just 6 miles away, providing activities all year round. The village has a number of eateries, something for everyone's taste, various shops to purchase gifts, art and everyday essentials. Glenlivet Estate and Distillery - Tomintoul lies on the Glenlivet Estate which compromises of 23 000 hectares which incorporate the world famous Glenlivet Distillery. There is a plethora of things to do for families and outdoor enthusiasts, including marked cycling trails, hiking trails, and fishing. Please click on the web site below for further information. The regions of Speyside and Strathspey are home to almost half of the 100 or so malt whisky distilleries in Scotland. This self guided walk follows way marked trails between distilleries is specifically chosen to provide the best combination of walking and whisky. Each days' walking allows you to visit distilleries and experience the processes and products that have made the amber liquid of ‘Scotch’world famous. Tomintoul is charmingly situated in the foothills of the Cairngorm Mountains, within the National Park. Tomintoul has something for everyone. In the heart of the Whisky trail we are close to many world famous distilleries with The Glenlivet and Glenfiddich within 14 miles of the village. Tomintoul is now also proudly the home of the worlds largest bottle of whiskey at a huge 105 litres, next door to us is the Whisky castle which has over 500 single malts so something to suit everyone's taste. For the two wheeled enthusiasts we are a regular stop on the Coast to Coast MTB cycle route as well as Lands End, John O' Groats for the road cyclists. Those who wish to take things a little easier could do a days riding on one of the Glenlivet Estate's many cycle trails or MTB trails 4miles out of the village, which caters for all levels. For the thrill seekers the Lecht Ski Centre offers two downhill MTB tracks as well as fantastic skiing in the winter months. 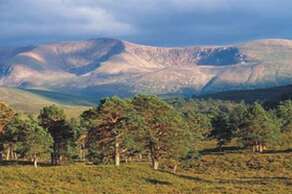 Discovering the local area on two legs puts you in the heart of the Cairngorm's National Park with all it has to offer. The Glenlivet Estate also wonderful way marked walks all around the village. We also have the well know Balmoral Castle –26 miles away or the Ballindallach Castle just 12 miles away for those who love castle’s. If none of the above is for you, then spending a day's fly fishing on the River A'an or the Spey for salmon could be your thing. Maybe all things wild are more up your street then a guided landrover tour with David Newland at Glenlivet Wildlife tours (www.glenlivet-wildlife.co.uk) will get you close to all the wee and not so wee beasties lurking about. Information on tour companies can be found in the guest house directory or ask Dianne or Steven.